The in basket: I came across what seemed an unusual operation on a recent trip to Belfair on the stretch of Highway 3 between Bremerton National Airport and Lake Flora Road. A large truck-mounted electronic sign said our lane was closed ahead and to yield to oncoming traffic. It had traffic stopped – almost. The truck was moving at a snail’s pace and since the first vehicle behind it was a semitrailer tanker truck, I couldn’t see what had closed our lane. It being a normal afternoon on that two-lane portion of Highway 3, oncoming traffic kept the tanker truck and those of us behind it pretty well pinned down as we crept along. I don’t know what the tanker was carrying, but its size and probably it’s cargo called for caution. Finally the tanker got a break in traffic and pulled out and around the sign truck, as did some of us behind it. We discovered that the lane was still blocked by a smaller slow-moving tank truck from which a stream of liquid was being sprayed on the shoulder. I saw the trucks twice more that day, once in the same southbound lanes, but moving at highway speed and not spraying anything, and later spraying the northbound shoulder. It obviously was a vegetation management operation, one of several discussed at length on the Washington State Department of Transportation Web site. But I wondered if there was anything unusual about it, as I often see mowers at work on the shoulder and know the state uses herbicides, but had never seen that slow-moving operation before. The in basket: Penny Swan e-mails to say, “We walk often, and live in the Tracyton area, so use Riddell Road. Who is responsible for knocking down the blackberry bushes and other brush along Riddell Road, on the south side by Peace Lutheran Church? County or city? The out basket: That is the city of Bremerton’s side of Riddell, and they plan to get to it, says Colen Corey, operations manager for city public works. Perry’s inquiry came just a week after Paul Zellinsky of Bremerton asked me the same thing. Paul was for 14 years a state representative here, and he said he contacted old friend Mary Margaret Haugen, now head of the Senate Transportation Committee, asking her to intercede to see that it is cleaned up. The out basket: Duke Stryker, head of the state’s highway maintenance operation here, said he hasn’t had any expressions of interest in that barrier from Olympia or regional headquarters. But he had his maintenance supervisor visit the site after I asked and he agrees the barrier needs attention. They’ll be getting to it as soon as they are done with pavement repair that requires a grinder, such as that on Wheaton Way, in Gorst and in Purdy, discussed in a recent Road Warrior column. They have to share the grinder, which they rent from the city of Bremerton, he said, and it will be going to Clallam County when they are done here. So his crews are working nights and have a limited time (through June) to complete this summer’s dig out and replacement pavement repair. Later, they’ll do less intensive grader resurfacing. I asked him if the demands of the awful winter of 2008-09 might have required cutbacks in aesthetic operations like cleanup of the center barriers on state highways the following summer. He said that’s a balancing act they do all the time, but he couldn’t say there was any necessary relationship between that winter and the barrier on 303. Certainly safety work like renewing highway striping every years and preservation work like the pavement repair take precedence over cleanup jobs, he said. I noticed there was some impressive vegetation along the jersey barrier farther north on 303, suggesting it was missed last year too. The in basket: Tom Loushe of Keyport writes, “I’ve noticed that on at least Highway 308 it seems the county has sprayed herbicide on roadside growth. Can this be true? And if so, is the solution detrimental to fish? “I’ve also seen it north of the Hood Canal Bridge toward Port Gamble,” he said. He describes the evidence as brown shriveled weeds, mostly small alder trees. The out basket: Those stretches are state highways, not county roads, and the state does use herbicides as part of its roadside vegetation control. Kitsap County does too. A lengthy discussion of the program statewide can be found online at http://www.wsdot.wa.gov/maintenance/vegetation/default.htm. 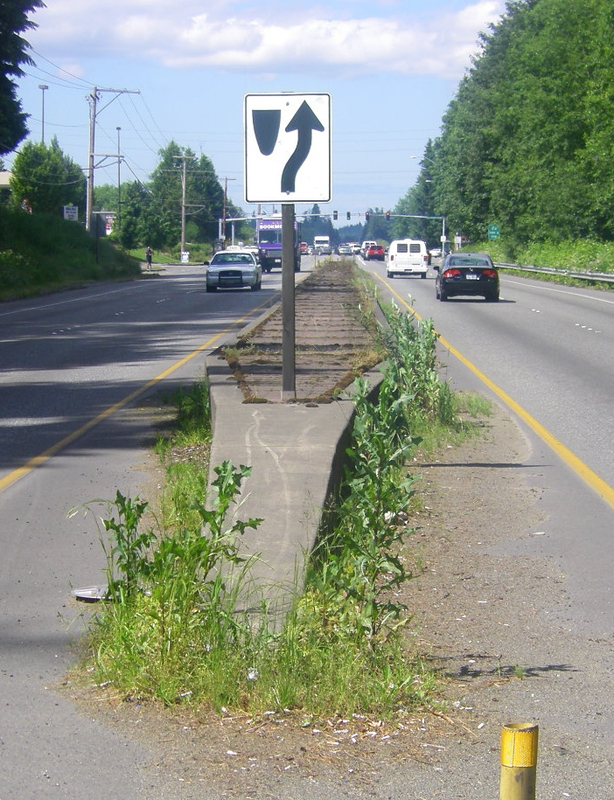 And if you click on Roadside Vegetation Management Plans under More Detailed Information, you can get to the Olympic Region, District 2 plan that covers state highways in Kitsap and Mason counties. There is a huge amount of information that would fill more than 50 pages if printed out. Duke Stryker, maintenance superintendent of state highways here, said herbicides were sprayed in both locations Tom mentions, so he presumably is seeing the result. Kitsap County also has a manual describing its standards. 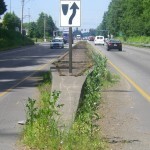 Go to http://www.kitsapgov.com/pw/roads.htm and click on Vegetation Management. I asked what percentage of clearing is done with chemicals vs. cutting and Doug Schultz, county road superintendent, replied. To understand his answer, you need to know that zone 1 is essentially the shoulder, zone 2 included where signs are installed and zone 3 extends to the limits of the right of way.